what would thanksgiving be without a table full of delectable goodies to share with the whole fam? if preparing a turkey is just to overwhelming for you (as in the case of kodomo founder, jasmine punzalan), then volunteer to bring the sides! in preparation for the big day, we asked jasmine to share some of her go-to (and fool-proof) holiday soup and salad recipes. 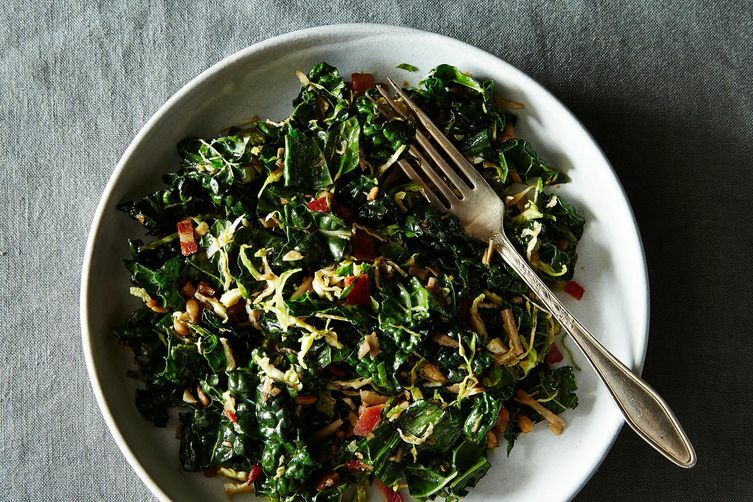 1. combine the kale and brussels sprouts in a medium bowl. add the bacon, cheese, and seeds; toss everything to combine. 2. whisk the dressing ingredients together in a small glass. heat the mixture in the microwave for 20 seconds, then whisk the dressing again and toss it into the salad. season with salt and ground pepper. 1. preheat oven to 350° F. place bread cubes on a baking sheet. drizzle with a little olive oil and toss to coat. toast bread in the oven until golden and crisp (5 to 10 minutes). remove from the oven and cool. 2. turn the oven temperature up to 400° F. place beets into a glass or ceramic casserole dish, drizzle with a bit of oil, add a splash of water, cover with foil and roast until tender (about 45 minutes). cool. 3. whisk oil, vinegar, orange juice, garlic, and a pinch of salt together in a small bowl. 4. cut the rind off the oranges (catching as much juice as possible in the dressing bowl) including the white pith just below the skin. cut the oranges crosswise into slices, then separate or cut the rounds into triangular segments. squeeze any remaining juice from the peel into the dressing. 5. place bread cubes, oranges, greens, herbs, celery, and capers into a large bowl. toss with dressing and allow the salad to sit for at least 10 minutes so the bread can soak up the dressing. stir periodically. 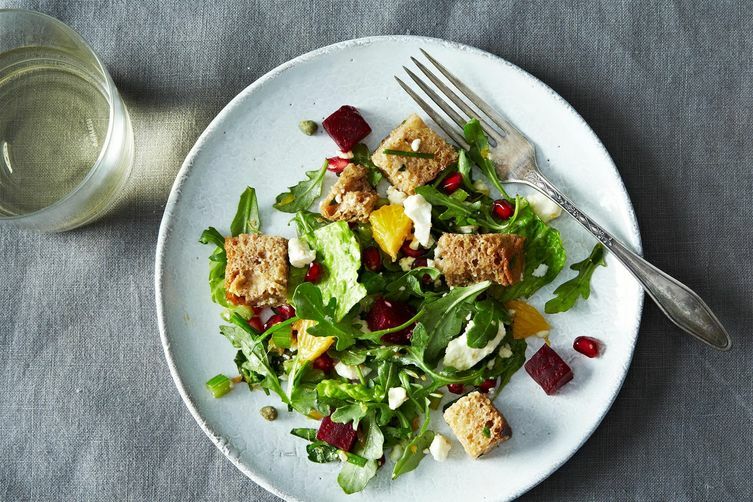 top with beets, cubed feta, and pomegranate seeds before serving. 1. in an 8-quart stockpot, add the butter and oil and melt together over medium-high heat. add the onion and carrot and cook, stirring occasionally, until the onion is soft, about 5 minutes. stir in the garlic and cook until aromatic, about 30 seconds. add the squash and the chicken stock. bring the mixture to a boil and add the sage. continue to boil until the vegetables are tender, about 20 minutes. turn off the heat. using an immersion blender, blend the mixture until smooth and thick. season with salt and pepper, to taste. keep the soup warm over low heat. 2. for the crostini: put an oven rack in the center of the oven. preheat the oven to 400 degrees. arrange the bread slices on a baking sheet. drizzle with olive oil and sprinkle with sage. sprinkle the cheese on top and season with salt, to taste. bake until the cheese has melted and the bread is light golden, about 6 to 8 minutes. 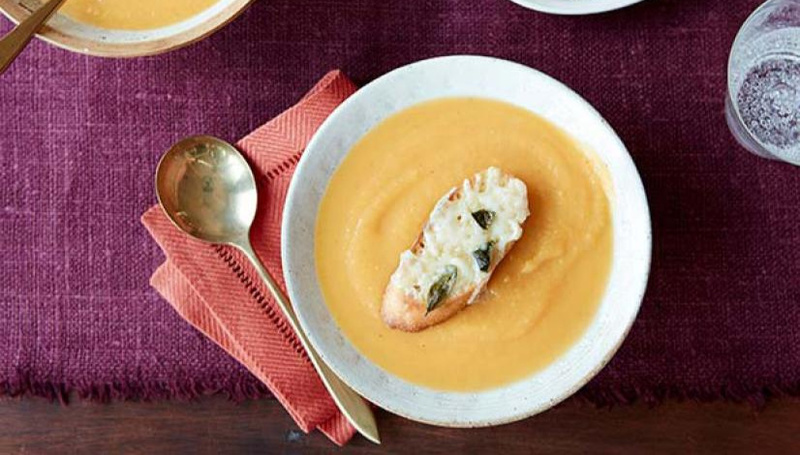 3. to serve, ladle the soup into bowls and garnish with the cheese crostini. 4. cook's note: the cooked vegetable mixture can also be pureed (after cooling for about 5 minutes) by ladling, in batches, into a food processor or blender and blended until smooth. 1. preheat oven to 400 degrees fahrenheit. 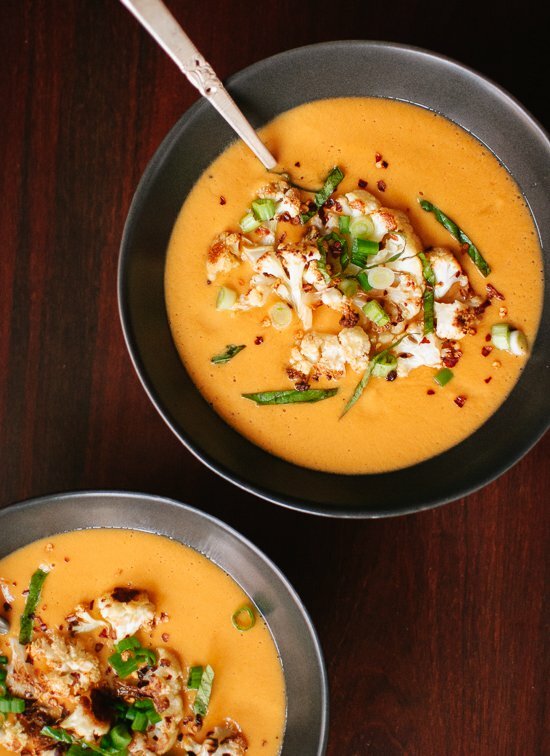 toss the cauliflower with enough coconut oil to lightly coat it (up to 3 tablespoons). spread the cauliflower in a single layer on a large baking sheet and roast until the tips of the cauliflower are golden brown, about 25 to 30 minutes. 2. in a dutch oven or large, heavy-bottomed pot over medium heat, warm 1 tablespoon of the coconut oil until shimmering. add the onion and a dash of salt and cook, stirring occasionally, until the onion is turning translucent, about 3 minutes. add the curry paste and lemon zest and stir to incorporate. raise the heat to medium-high, add the wine, and cook, stirring frequently, until most of the wine has evaporated. 3. add all of the roasted cauliflower stems and half of the florets to the pot. add the vegetable broth, coconut milk and sugar. bring the mixture to a gentle simmer, stirring occasionally. continue simmering for 5 to 10 more minutes to meld the flavors, reducing heat as necessary to maintain a gentle simmer. remove the pot from the heat. 5. stir in 1 teaspoon vinegar and salt and pepper, to taste. if the soup needs more acidity, stir in 1 to 2 additional teaspoons of vinegar, to taste. ladle the soup into 4 bowls. top each with ¼ of the cauliflower florets, a sprinkle of basil and chives and hot peppers (if using).